The markets are flooded with inexpensive cordless hand screwdrivers. However, when we talk of a high quality and multipurpose cordless screwdriver, the name of Milwaukee comes immediately to our mind. The C12D model, particularly, has so many innovative features and most convenient to use that one would not hesitate to buy it even if it is little more expensive compared to other types of screwdrivers. The Milwaukee C12D screwdriver has an illuminated gauge to indicate how much power is left in the battery. The LED displays provided in the tool lights up the work spot, whenever required, obviating the need to carry a flashlight. A well-positioned switch on the C12D enables you to switch from forward mode to reverse mode and vice-a-versa without any difficulty. 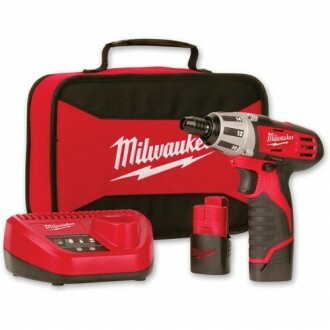 The battery supplies 12 volts of electric power for drilling and pushing screws into wood or metal. This unique design protects the screwdriver even if it is used beyond its maximum load. Without the built-in safety features, this tool would not be of any use at work sites, in the garage or for rough daily use. That is why Milwaukee brand C12D 12V cordless screwdriver is rated very high by both reviewers and users, amply justifying its brand name. The cordless screwdriver can rotate up to five-hundred revolutions per minute and has the ‘maximum stall torque’. This means that the device cannot get damaged due to overheating when left in a stalled condition for long hours. In addition, one of the other finest features in Milwaukee C12D is its ‘fourteen torque positions’, which can be set with a tap of a finger. These features make the screwdriver ideal for wide variety of tasks. The cordless screwdriver is useful to work on softwoods, such as cedar, fir or pine as well as hardwoods, like alder or oak. In addition to wood, the versatile C12D is so sturdy that it can also drive screws into hard metal. The Milwaukee C12D takes ¼ inch ‘hex bit’ and its operating duration is around 20% more than any other similar screwdriver. Another notable feature is that, unlike other comparable screwdrivers, its lithium-ion battery is light-weight, weighing less than one kilogram and has an excellent capacity to retain charge for long duration and does not get drained out even if it is not in use for a few days. The C12D screwdriver is quite light because of the lithium-ion battery and yet it can handle very tough jobs both at home and at construction sites. As it is not heavy, you can carry the screwdriver from place to place at work sites. With several unique features such as driving power, maneuverability and convenient to hold it in hand, Milwaukee C12D screwdriver beats competition hands down. The robust construction and numerous options at his command makes the user feel completely satisfied with the performance. It is no wonder that Milwaukee C12D 12V screwdriver is the first choice for those who are looking for an ideal cordless screwdriver.